Electrolux - Duracloth Steam Microfiber Cleaning Pads, 68992 Duracloth Microfiber Cleaning Pads are made to fit specific Shark and Eureka Steam Mops. Durocloth cleaning pads are machine washable and reusable. DIRT DEVIL - Steam Mop Replacement Pads, AD50010 Just mop and wash use these microfiber pads with your Dirt Devil Versa Steam Mop two-in-one to cut through grease and grime on all sealed hard floors. 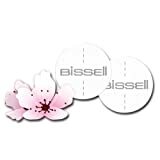 Bissell - Powerfresh Pet Scent Discs Odor Eliminating Fragrance discs for use with BISSELL POWERFRESH SYMPHONY and VAC and STEAM steam mops. Electrolux - Duracloth Steam Microfiber Cleaning Pads, 68991 Duracloth Microfiber Cleaning Pads are made to fit Shark Pocket Mop Steam Mops. These durable cleaning pads are machine washable and reusable. Generic - Shark Easy Spray Steam Mop DLX, SK141 The Shark Easy Spray Steam Mop DLX offers superior cleaning and faster dry times in an easy-to-use lightweight mop design. The Easy Spray Steam Mop DLX automatically steams as you clean with patented steam on demand technology!
. - Bissell Steam Mop Hard Floor Cleaner, 18677 The sleek and lightweight Bissell Steam Mop Hard Floor Cleaner 18677 can clean and sanitize your linoleum tile vinyl and sealed hard wood floors effortlessly. It features a 9 cleaning path width for excellent floor coverage. Haan - HAAN Swift Sanitizing Steam Mop, SI-25 The lightweight HAAN SI-25 Sanitizing Steam Mop is easy to use and easy to assemble. The HAAN steam mop thoroughly cleans and sanitizes small or large areas while killing up to 99.9 percent of common household germs and bacteria.